Lithium batteries have rapidly become one of the most popular types of rechargeable batteries not only for portable electronic devices, but across a range of applications as diverse as military, aerospace and electronic vehicles. They set themselves apart from other batteries with their high charge density, cycle life, low maintenance and performance. With lithium batteries widely recognised as the most promising battery technology for the future, big tech companies and manufacturers of electric vehicles across the globe are investing heavily in battery development and research. As such, lithium batteries are advancing not only in technology, but also economy, manufacturability and environmental sustainability. Sealed Performance Batteries – Australia’s premier wholesaler of energy and storage products – are excited to be at the forefront of this power revolution, and are one of the few suppliers in the country to offer a range of different lithium ion technologies. With twenty years industry experience, Sealed Performance Batteries have been involved with lithium battery technology since the early years of commercial introduction – a history that has provided an in-depth understanding of the most suitable lithium technology for specific applications. 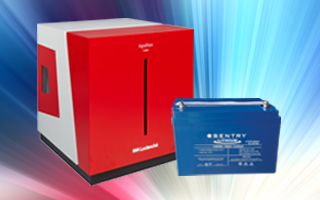 Sentry: The 12V LiFePO4 range designed specifically for SLA replacement applications. They come in standard case sizes with built in BMS for safety and protection and are ready to go off the shelf. Currently Sealed Performance Batteries offer sizes from 7.5Ah through to 120Ah, with additional sizes available on request. Leclanche: The Apollion Cube, a 6.7kWh energy storage system designed specifically for residential solar energy storage applications. Manufactured in Germany, and of the highest quality NMC cell technology, it has some great advantages over other systems, including its high power output. Leclanche also offer the Lithium Titante (LTO) range – a high power, high cycle life technology design for applications required to cycle more than once per day and/or have high charge or discharge requirements. Both the NMC and LTO come in scalable rack mount form factor for commercial up to utility sized MWh options. With more and more options entering the market regularly to cover off on different applications, the lithium ion market segment is set to continue with strong growth. The team at Sealed Performance Batteries is ready to embrace the power revolution and pass the benefits on to their clients. “The advances in lithium battery technology will see new options for our customers as well as new applications for lithium technology,” says Hammond. Whatever the size or complexity of your application, Sealed Performance Batteries have the right battery product or energy storage solution for you. Contact us for your energy storage requirements.